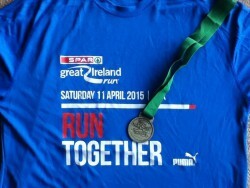 This entry was posted in 10 mile and 10k, Dublin and tagged Great Ireland Run, phoenix park, running. Bookmark the permalink. Well done a PB is a PB. You may be better off attacking 40 minutes on a lower key race. The first time I went sub 40 was in a field of 350 . Are you adding some 10k specific intervals into your training now? Thanks – yes, I’ll see if I can find a better course for sub-40 i.e. flatter than today’s course. I had been concentrating on parkruns and short threshold training runs for April and May, but I might do some short sprints too and look up some 10K-specific sessions. Great job! You are getting closer to that sub-40. I think finding a flatter and faster course will get you there. Thanks! Yes, a good flat course should see me close to sub-40. Oh well done – you’ll so get your sub-40 soon. But in the meantime enjoy your PB. Cheers – that sub-40 is going to obsess me now! Congrats on a great race and a new PR! Good stuff, I found it very windy too which is always a bit of a pain but it’s a nice course overall. I think I caught your chest infection the week after so at least was feeling clear-chested during the race! I’d like if they resurfaced the part that dips down into the Furry Glen it’s the worst surface on the course. Well done on the PB. Cheers – I hope you had a good run too; sorry for passing on my chest infection to you over the crowds! Only a couple of weeks beforehand that road down the Furry Glen was all loose chippings and mud, so race day was actually an improvement!